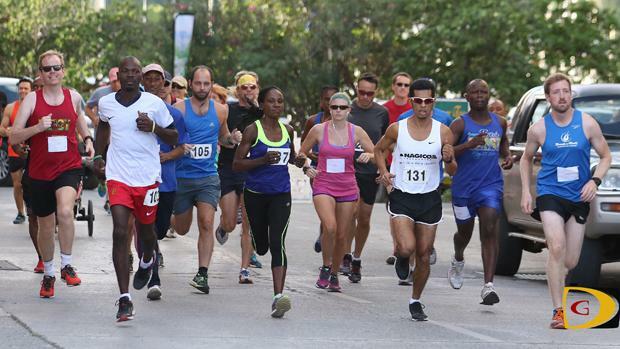 Although they had won the respective Ceres Juices 10k Series titles heading into Saturday afternoon's finale, Reuben Stoby and Rosmond Johnson were pushed to the wire, with Johnson being beaten by Melissa Brunner, for the first time. Stoby went out hard then hanged on for a seven seconds victory over fast charging Vincent Fouriner. Stoby covered the loop from Road Town to Sea Cows Bay and return in 37 minutes and 50 seconds, with Furrier recording a time of 37:57. "I have heard of Vincent before and when I saw him this afternoon, I realized that I was going to be pushed, so I decided to go with my plan which was to go out fast," Stoby explained. "I did a training run last week and I did 38:23, so that gave me a lot of courage that I could run fast and I gave it a try today. He came close to me in the end because I had a big lead on him. I had to dig deep-I'm not sure where I found that last kick-but I'm happy about that." For Fouriner who came to the BVI three weeks ago and resides on Virgin Gorda, it was his first race on Tortola. "I was my fastest 10K ever. I did 39 before and this was below 38, I'm very happy," he said. "I was trying to catch Stoby at the end, but, he got a good sprint." Brunner, who had been chasing Johnson all season ran 49:04 to outdistance Johnson's 50:21, beating her for the first time. "Oh man, I've been pushing for this all season and it felt amazing, I've never won anything and I finally did," Brunner noted. "I've been training really hard, so I'm super impressed. So proud of myself." Brunner said she overtook Johnson about three and a half miles into the race when she saw her walking. "I just pushed it hard all the way to the end and kept her in my rearview mirror," she said. Johnson said when Brunner passed she said: 'yes, I got you. I've finally won you now.' "Then straight away I passed her again, but she's doing the distances and I'm doing the sprints," Johnson said of Brunner's endurance. "Then, the winds also made me slow down. I was planning on catching her, but the race didn't last long enough." Final results. Men: 1. Reuben Stoby, 37 minutes and 50 seconds. 2. Vincent Fournier, 37:57. 3. Julius Farley, 38:51. 4.Ian Montgomery, 40:51. 5. Curwin Andrews, 43:57. 6. Simon Cook, 45:49. 7. Benjamin Lewis, 47:10. 8. Richard Morgan, 47:22. 9. Zebalon McLean, 47:58. 10. Adam Holdt, 48:16. 11. Mark Stephenson, 48:26. 12.Adrian Dale, 48:49. 13. Shane Donovan, 49:43. 14. Ruairi Bourke, 52:19. 15.Claudius Rhymer, 54:23. 16. Howard Moore, 1:01.20. 17. Sjoerd Koster, 1:16.26. 18. Jovan Van Heerden, 1:16:58. 19. Bill Kinkead, 1:19.30. 20.Richard Parchment, 1:21.18. Women: 1. Melissa Brunner, 48:03. 2. Rosmond Johnson, 48:41. 3. Kay Reddy, 53:13. 4. Debbie Bell, 53:57. 5. Philomena Robertson, 57:35. 6. Rhiannon Jones, 1:01.37. 7. Sarah Duncan, 1:07.31. 8. Rahel Worede, 1:16.26. 9. Shirley Liburd, 1:33.45. 4.8 Miles. Women: 1. Brodie Faragher, 49:17. 2. Rebecca Cook, 52:45. Men: 1. Barry Leon, 58:26. Power Walkers: 1. Sophie Bennett, 1:40.38. 2. Linda Li, 1:41.02.